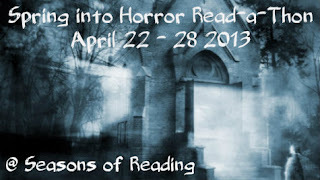 Midnyte Reader: Spring into Horror Read-a-Thon giveaway. To keep your scare going even after the Spring into Horror Read-a-Thon, I am giving away a copy of The Near Witch by Victoria Schwab. To enter, you MUST be signed up for Seasons of Reading Horror Read-a-Thon. You can sign up HERE. If you enter the contest and are not signed up, you will be disqualified. ~One (1) winner will receive a hardcopy of The Near Witch. ~Contest ends on Sunday, April 28th at 12:15am. I'm listening to BREED by Chase Novak and reading THE END GAMES by T. Michael Martin. I'm also hoping to squeeze in Rhiannon Frater's IN DARKNESS WE MUST ABIDE series. I am starting off the read-a-thon with an ARC that has been patiently waiting upon my shelves for some time. It's "Little Star" by John Ajvide Lindqvist. Thanks for the giveaway and happy reading this week! Great book choice for the prize by the way.